February 20, 2018 Dan O.
Couldn’t it have been longer? The year is 2016 and President Barack Obama is finishing up his final 12 months in office and he’s already got a lot to do. However, he’s not the only one focused on here, as the rest of his foreign policy team get ready to solve all sorts of issues and ensure that whoever is next to take office, is actually ready to take care of the issues that they’ve already covered. But with the way the upcoming election’s already turning out, right in front of their very eyes, they begin to grow more and more wearisome than ever before, wondering if they are making the right decisions in the first place, if only to just watch them fumble and fold several months later due to a certain someone taking office. And you can bet who I’m talking about. I wonder if the Final Year will get more relevant as the year goes on, where it seems like all our foreign policies have gone from bad-to-worse, due to certain Presidents not knowing when to delete a tweet. Cause as the Final Year shows, it’s up to a few individuals who keep the dialogue going between us and other countries, in hopes that no wars are started again, no genocides ever get committed, and everyone is, for the most part, playing a fair ball-game. The movie isn’t so much about Obama and/or Democrats in general, as much as it’s about shining a light on those who do their jobs well and are doing it because they believe in their country and have faith in all that is right. And of course, the Final Year is also about how it may all blow-up in their faces, too, which makes it a tad bit more interesting than you’d expect. Still, as a documentary, director Greg Barker doesn’t go nearly as deep as he could; granted, it would be incredibly hard to cover everything in full-depth that he does here in 90-minutes-or-less, but there are even times when it seems like he touches on something for a brief second and runs away from it, never to return. One such important discussion, for many reasons, climate change. We get a very small scene of John Kerry in the ocean, watching the glaciers melt and hearing about how climate change is an issue, but just as soon as we think it may be about that, it scurries along to the next possible story. Sure, Barker has a lot of ground to cover and it’s already an admirable feat on his part for getting granted this access in the first place, but he never quite does much with that said access – we get plenty of quotes and up-close interviews with certain people in power, but yeah, that’s about it. We get to see Samantha Power over in foreign countries, defending human rights, as well as herself at home, with her family, but really, it’s nothing too shocking or compelling that you probably couldn’t have seen on a 60 Minutes special. 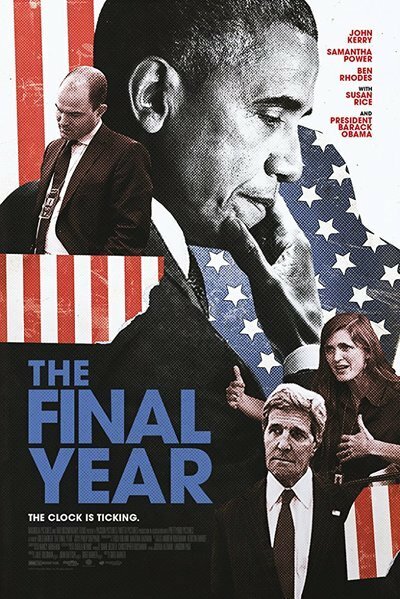 But still, it’s hard to be totally angry at a movie like the Final Year, especially since it comes out around a time when, whether you loved him or not, someone like Obama may be a bit of a welcome-presence. Which is why the Final Year is an interesting documentary – it’s not a warts-and-all take on these select few, nor is it a puff-piece. It’s just an insider’s look on the day-in, day-out lives of these few who do their best to stay cool, calm, and collected, even when they know so much is at-stake. Sure, they aren’t arming up and going off to war, but they’re the people to make sure we don’t ever get into those situations, and in a way, that’s almost more important. So yeah, see it for them. And to also remind yourself that foreign-policy isn’t always a joke in some Presidents’ eyes. Consensus: As an insider’s-look, the Final Year offers the occasional glimpses of interesting and insight, but mostly plays as a little too much, for so little of the time we have with it. And sure, maybe that’s the point. It’s okay. Some people just want to watch the world burn. It’s not your faults. Okay, maybe a little bit.